There are few industries in which the case for commercial solar installations is as compelling as real estate management and development. Current net metering and community distributed generation laws allow property owners to generate power offsite, apply credits to tenant utility bills and then charge tenants for their energy consumption. The ability to directly monetize your energy credit production, in addition to bottom-line savings on energy consumption can drastically reduce the payback periods associated with solar investments. Additionally, the combination of Federal Tax incentives, accelerated depreciation, and available grants make investments in solar a useful tool for eliminating the tax liability associated with rental incomes. Whether you're interested in a partial offset through the use of a roof-mounted system or powering a network of dozens of properties with an off-site system, Renovus can craft and develop a solution that will add to your bottom line. The power of using solar energy for residential and commercial properties comes from the scaleability of the investment. Every tenant who transitions to a rental agreement including electricity becomes an additional source of income for the property owner. By using historical consumption data, landlords can establish running rates for electrical usage, charge tenants for the delivery of said electricity, and make a profit on every kWh generated by their solar system. ​Using this model, and current electricity rates, landlords can make as much as $55 per month for every 500kWh of power consumed by a tenant, just by charging market rates. Due to the ability to directly monetize energy generation, solar systems deployed by residential and commercial property owners have payback periods 15-25% shorter than other industries on average. Due to the U.S governments extension of the Federal Income Tax Credit, commercial solar clients will still be able to leverage a 30% cost reduction on their system in the form of a tax credit for their investment. There is no cap on this credit, so many investors buy sizeable systems and use that investment as the single most substantial form of tax relief for their business in that calendar year. 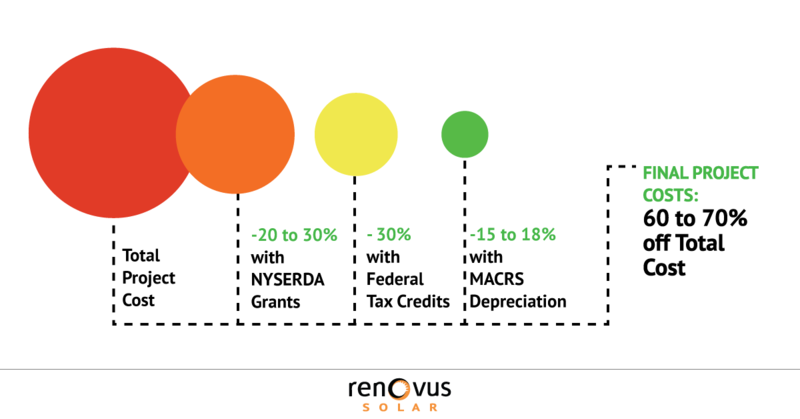 The combination of the Federal ITC, MACRS Accelerated depreciation benefits, and NYSERDA grant costs mean that the average commercial solar investor is saving on their monthly utility costs AND getting a solar system for as much as 70% off sticker price. ​NYSERDA - NYSERDA, an NY based organization that runs and operates the NY-SUN initiative, offers grants based on the size of the system installed. These grants can typically reduce the up-front costs of projects by 20% or more. Federal ITC - The Federal Investment Tax Credit is the most impactful tool for making commercial solar financially attractive. 30% of the total project cost can be taken as a dollar for dollar tax credit flexibly according to you tax appetite. Bonus Depreciation - Due to recent tax reform, solar customers can depreciate 100% of the allowable capital costs in Year 1 rather than over five years. 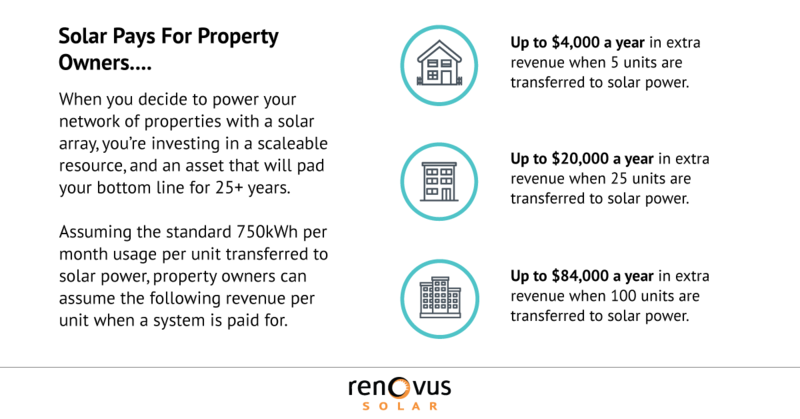 BY claiming these benefits immediately, you can drastically impact the payback period of your solar system. 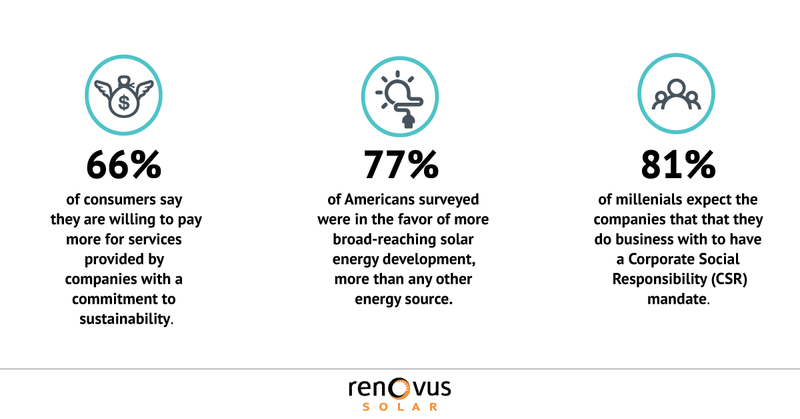 When you invest in solar with Renovus, our work doesn't stop when the system is interconnected. Solar is a substantial investment, and a source of sustainable power that your clients, tenants, and stakeholders should be made aware of. Corporate responsibility is no longer a topic saved for fortune 500 companies. Savvy consumers want the businesses they patronize and partner with to be both financially and environmentally responsible. Solar installations offer a relatable and easily promoted story line with which to extol the virtues of your commitment to responsible investing and energy consumption practices. 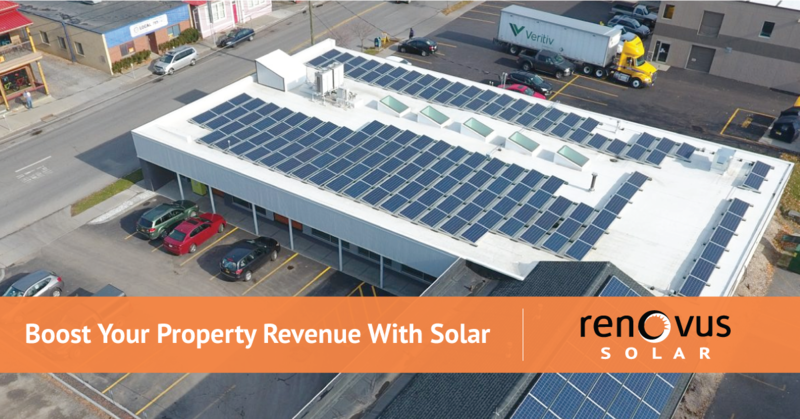 ​Sure, your business will start saving thousands of dollars on energy bills, but how can you use your solar investment to boost revenue? We’ll work with your marketing, sales, or communication teams to create content, promote events, run press campaigns or promote internal sales engagement. We'll then work with your team to determine the best possible way to control the narrative around your solar system, and use it as a product differentiator in a crowded marketplace. ​INTERESTED IN BOOSTING YOUR PROPERTY REVENUE? ​Curious about going solar in 2019? ​Grab our can't miss guide to learn about incentives, purchasing options, and trends to watch for.